Carefree middle-aged divorcee Gloria (Academy Award winner Julianne Moore) works at an office by day and dances at clubs by night, unshackled from responsibility and relationships. But when she meets Arnold (John Turturro), she plunges into a new romance she never expected - with all the highs and lows she thought she’d left behind. 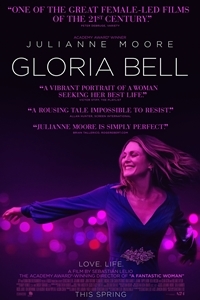 Academy Award-winning director Sebastian Lelio (A FANTASTIC WOMAN) revisits his award-winning 2013 film GLORIA in GLORIA BELL. Transplanting his Chilean original to Los Angeles with a star-studded English-language cast, Lelio’s new version is funny, romantic, honest, and possessed of a high-flying spirit rarely found in cinema. Featuring one of Julianne Moore’s most sparkling performances, along with supporting turns from John Turturro and Michael Cera, GLORIA BELL is a celebration of the joys and hazards of loving other people. "It is a flat-out showcase for Moore, and it’s simply invigorating to see an actress of her caliber capture a character so memorably."